This ASUS K501LX-EB71 15.6-Inch FHD laptop does exceed all of my expectations and then a few more. I was looking for a new laptop for my school, to play games, so it has to be solid, and light. I was very surprised that this laptop is incredible thin and light. It is so thin, so it does not come with optical/DVD drive. The brushed aluminum body makes the laptop standing out, a very high end appearance exterior. Given its price range, this ASUS K501LX-EB71 is pretty powerful. It runs the 2-cores 2.4GHz Intel Core i7-5500U with Turbo Boost up to 3.00 GHz, which is really great if you want to run multiple advance programs at one time, without lagging issue. The i7 Intel Processor combined with the latest NVIDIA GeForce GTX 950M (2G, GDDR3) makes video editing or games running a breeze and energy efficient, haven’t had any lagging or crashing issues since owning this laptop for 23 days, and I run video editor programs almost everyday. By default, ASUS K501LX comes with DDR3L 1600MHz 8GB RAM. For daily use, the memory should be powerful enough. However, for those who wants to upgrade the memory, the 8GB is placed on different places, the 4GB on-board memory is not upgradeable but the 4GB SO-DIMM can be replaced with a 8GB memory, so 8+4, total will reach 12GB max. upgrade of the RAM. For playing intense games, I have played, Skyrim, Age of Mythology and The Forest, I could play them without problems, and with high settings. I got 30+ FPS for all of them. This ASUS K501LX-EB71 comes with 256GB M.2 SSD instead of 128GB. If you want to have a standard hard drive, and a 1TB HDD, you can check out this model. Since it is a SSD, it boots up blazingly fast. Boots up and shutting down your computer is incredibly fast, about 3-5 seconds, also after upgrading my laptop to Windows 10. There is another extra hard drive slot if you want to add extra HDD to add the 256GB storage. Just make sure, the HDD you want to install to the spare slot is a 2,5″ 7mm tall Hard Drive. The ASUS K501LX-EB71 keyboard has backlit keys, and it is so nice designed. The keys are nicely located, and there is a numpad on the right side. When I turned it on for the first time, the backlit feature was turned off. To turn it on, hold your “FN” or function key and press your F4 key to turn up the brightness and F3 to turn it down or turning it off. It has so nice keyboard, and cannot describe how beautiful it is, but you will understand it once you see it yourself. The keys and trackpad are responsive, and chiclet style, so nice to type on. The display, is not a touchscreen but a full HD 1080p resolution, which is fantastic, it is also a TN, not an IPS screen, but a matte one, so won’t be so shiny if you want to use it under the sun light. I hear a lot of complaining of the screen, but it is not that bad. For this price range, you won’t get an IPS screen with the best viewing angles like Apple’s Retina Display, but I find that the screen is a decent standard laptop screen, not the best, but fine. I wish there was an improvement on the cooling system. The vents are located on the back and the side of the laptop. I find the fan is loud when its working, and if you are really paying attention on it, it will be noticeable, otherwise you won’t. It is not a huge disappointment. The air will blow on the back, so it will blow the heat away from the user, so it won’t burn you. The battery is a non-replaceable, but it has fantastic battery life. It depends on what programs you are using, but I got 3 hours for intensive gaming. For browsing and editing documents, I even reached 7-8 hours battery life. Overall, it is a fantastic slim compact powerful laptop. I think, this ASUS K501LX is the best option for good looking and power at this price range. Strangely, other sites have it on 900 bucks but found less in here. 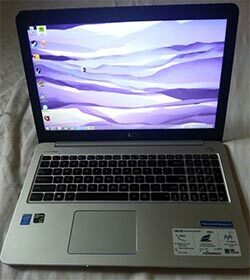 Will I recommend this laptop? The answer is short, “yes, definitely”. If you are looking for solid built, and powerful little 15 inch laptop, it is hard to find better option than this. For under 800 you are paying for tons of great specs, SSD, a full HD 1080 resolution screen, fast newest GTX 950M graphics, decent i7 CPU, and 8GB memory, lastly, this ASUS K501LX-EB71 is a lot cheaper and more compact than the fancy gaming laptops. → Next: ASUS F555LA-AB31 15.6-inch Full-HD Laptop (Core i3, 4GB RAM, 500GB HDD) with Windows 10 i3?